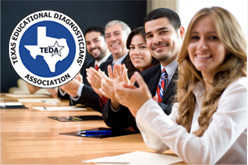 To promote the profession of Educational Diagnostician through programs, through research, and through the establishment and maintenance of professional standards in order to better serve the educational needs of exceptional children and youth. New to this field? We love new members. Please address any questions about TEDA membership to Julie Malewska at presidentelect@dalmetroteda.org.